Not to be confused with Neutral Nation. Different countries interpret their neutrality differently. Some, such as Costa Rica, have demilitarized; whereas Switzerland holds to "armed neutrality" in which it deters aggression with a sizeable military while barring itself from foreign deployment. Not all neutral countries avoid any foreign deployment or alliances, however, as Austria, Ireland, Finland and Sweden have active UN peacekeeping forces and a political alliance within the European Union. The traditional Swedish policy is not to participate in military alliances, with the intention of staying neutral in the case of war. Immediately before World War II, the Nordic countries stated their neutrality, but Sweden changed its position to that of non-belligerent at the start of the Winter War. A neutral country in a particular war, is a sovereign state which officially declares itself to be neutral towards the belligerents. The rights and duties of a neutral power are defined in Sections 5 and 13 of the Hague Convention of 1907. A permanently neutral power is a sovereign state which is bound by international treaty to be neutral towards the belligerents of all future wars. An example of a permanently neutral power is Switzerland. The concept of neutrality in war is narrowly defined and puts specific constraints on the neutral party in return for the internationally recognized right to remain neutral. Neutralism or a "neutralist policy" is a foreign policy position wherein a state intends to remain neutral in future wars. A sovereign state that reserves the right to become a belligerent if attacked by a party to the war is in a condition of armed neutrality. A non-belligerent state is one that indirectly participates in a war, politically and/or materially helping one side of the conflict and thus not participating militarily. For example, it may allow its territory to be used for the war effort. Belligerents may not invade neutral territory, and a neutral power's resisting any such attempt does not compromise its neutrality. A neutral power must intern belligerent troops who reach its territory, but not escaped prisoners of war. Belligerent armies may not recruit neutral citizens, but they may go abroad to enlist. Belligerent armies' personnel and material may not be transported across neutral territory, but the wounded may be. A neutral power may supply communication facilities to belligerents, but not war material, although it need not prevent export of such material. Belligerent naval vessels may use neutral ports for a maximum of 24 hours, though neutrals may impose different restrictions. Exceptions are to make repairs—only the minimum necessary to put back to sea—or if an opposing belligerent's vessel is already in port, in which case it must have a 24-hour head start. A prize ship captured by a belligerent in the territorial waters of a neutral power must be surrendered by the belligerent to the neutral, which must intern its crew. Neutrality has been recognised in different ways, and sometimes involves a formal guarantor. For example, Austria has its neutrality guaranteed by its four former occupying powers, Switzerland by the signatories of the Congress of Vienna and Finland by the Soviet Union during the Cold War. The form of recognition varies, often by bilateral treaty (Finland), multilateral treaty (Austria) or a UN declaration (Turkmenistan). These treaties can in some ways be forced on a country (Austria's neutrality was insisted upon by the Soviet Union) but in other cases it is an active policy of the country concerned to respond to a geopolitical situation (Ireland in the Second World War). For the country concerned, the policy is usually codified beyond the treaty itself. Austria and Japan codify their neutrality in their constitutions, but they do so with different levels of detail. Some details of neutrality are left to be interpreted by the government while others are explicitly stated, for example Austria may not host any foreign bases and Japan cannot participate in foreign wars. Yet Sweden, lacking formal codification, was more flexible during the Second World War in allowing troops to pass through its territory. Military preparedness without commitment, especially as the expressed policy of a neutral nation in wartime; readiness to counter with force an invasion of rights by any belligerent power. Neutrality maintained while weapons are kept available. Armed neutrality makes a seemingly-neutral state take up arms for protection to maintain its neutrality. Sweden and Switzerland are, independent of each other, famed for their armed neutrality, which they maintained throughout both World War I and World War II. The Swiss and the Swedes each have a long history of neutrality: they have not been in a state of war internationally since 1815 and 1814, respectively. They pursue, however, active foreign policies and are frequently involved in peace-building processes around the world. According to Edwin Reischauer, "To be neutral you must be ready to be highly militarized, like Switzerland or Sweden." In contrast, other neutral states may abandon military power (examples of states doing this include Costa Rica and Liechtenstein) or reduce it, but rather uses it for the express purpose of home defence and the maintenance of its neutrality. But the lack of a military does not result in neutrality as countries such as Iceland replaced a standing military with a military guarantee from a stronger power. The phrase "armed neutrality" sometimes refers specifically to one of the "Leagues of Armed Neutrality". The First League of Armed Neutrality was an alliance of minor naval powers organized in 1780 by Catherine II of Russia to protect neutral shipping in the War of American Independence. The establishment of the First League of Armed Neutrality was viewed by Americans as a mark of Russian friendship and sympathy. This league had a lasting impact of Russian-American relations and the relations of those two powers and Britain. It was also the basis for international maritime law, which is still in effect. In the field of political science, this is the first historical example of armed neutrality, however, scholars like Dr. Carl Kulsrud argue that the concept of armed neutrality was introduced even earlier. Within 90 years before the First League of Armed Neutrality was established, neutral powers had joined forces no less than three times. As early as 1613, Lubeck and Holland joined powers to continue their maritime exploration without the commitment of being involved in wartime struggles on the sea. The Second League of Armed Neutrality was an effort to revive this during the French Revolutionary Wars. It was an alliance with Denmark-Norway, Prussia, Sweden and Russia. It occurred during 1800 and 1801. The idea of this second league was to protect neutral shipping from the British Royal Navy. However, Britain took this as the alliance taking up sides with France, thus attacking Denmark. The alliance was forced to withdraw from the league. A potential Third League of Armed Neutrality was discussed during the American Civil War, but was never realized. For many states, such as Ireland and Sweden, neutrality does not mean the absence of any foreign interventionism. Peacekeeping missions for the United Nations are seen as intertwined with it. The Swiss electorate rejected a 1994 proposal to join UN peacekeeping operations. Despite this, 23 Swiss observers and police have been deployed around the world in UN projects. The legitimacy of whether some states are as neutral as they claim has been questioned in some circles, although this depends largely on a state's interpretation of its form of neutrality. Mr Pflüger described Finland as neutral. I must correct him on that: Finland is a member of the EU. We were at one time a politically neutral country, during the time of the Iron Curtain. Now we are a member of the Union, part of this community of values, which has a common policy and, moreover, a common foreign policy. However, Finnish Prime Minister Juha Sipila on 5 December 2017 still described the country as "militarily non-aligned" and that it should remain so. Ireland, which sought guarantees for its neutrality in EU treaties, argues that its neutrality does not mean that Ireland should avoid engagement in international affairs such as peacekeeping operations. Since the enactment of the Lisbon Treaty, EU members are bound by TEU, Article 42.7, which obliges states to assist a fellow member that is the victim of armed aggression. It accords "an obligation of aid and assistance by all the means in [other member states'] power" but would "not prejudice the specific character of the security and defense policy of certain Member States" (neutral policies), allowing members to respond with non-military aid. With the launch of Permanent Structured Cooperation (PESCO) in defense at the end of 2017, the EU's activity on military matters has increased. The policy was designed to be inclusive and allows states to opt in or out of specific forms of military cooperation. That has allowed most of the neutral states to participate, but opinions still vary. Some members of the Irish Parliament considered Ireland's joining PESCO as an abandonment of neutrality. It was passed with the government arguing that its opt-in nature allowed Ireland to "join elements of PESCO that were beneficial such as counter-terrorism, cybersecurity and peacekeeping... what we are not going to be doing is buying aircraft carriers and fighter jets". Malta, as of December 2017, is the only neutral state not to participate in PESCO. The Maltese government argued that it was going to wait and see how PESCO develops to see whether it would compromise Maltese neutrality. The neutrality of Moldova is an interesting case. According to Ion Marandici, Moldova has chosen neutrality in order to avoid Russian security schemes and Russian military presence on its territory. Even if the country is constitutionally neutral, some researchers argue that de facto this former Soviet republic never was neutral, because parts of the Russian 14th army are present at Bendery. The same author suggests that one solution in order to avoid unnecessary contradictions and deepen at the same time the relations with NATO would be "to interpret the concept of permanent neutrality in a flexible manner". 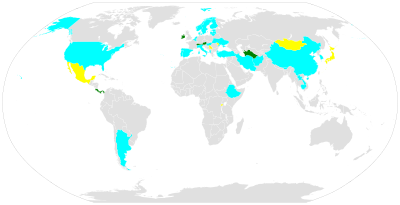 Many countries made neutrality declarations during World War II. However, of the European states closest to the war, only Andorra, Ireland, Portugal, Spain, Sweden, Switzerland (with Liechtenstein), and Vatican (the Holy See) remained neutral to the end. Their fulfillment to the letter of the rules of neutrality has been questioned: Ireland supplied important secret information to the Allies; for instance, the date of D-Day was decided on the basis of incoming Atlantic weather information, some of it supplied by Ireland but kept from Germany. Both Axis and Allied pilots who crash landed in Ireland were interned. Sweden and Switzerland, surrounded by possessions and allies of Nazi Germany similarly made concessions to Nazi requests as well as to Allied requests. Sweden was also involved in intelligence operations with the Allies, including listening stations in Sweden and espionage in Germany. Spain also pursued a policy of "non-alignment" though a Spanish volunteer combat division aided the Nazi war effort. Portugal officially stayed neutral, but actively supported both the Allies by providing overseas naval bases, and Germany by selling tungsten. The United States was initially neutral and bound by the Neutrality Acts of 1936 not to sell war materials to belligerents. Once war broke out, US President Franklin Delano Roosevelt persuaded Congress to replace the act with the Cash and carry program that allowed the US to provide military aid to the allies, despite opposition from isolationist members. Sweden also made concessions to the German Reich during the war to maintain its neutrality, the biggest concession was to let the 163rd German Infantry Division to be transferred from Norway to Finland by Swedish trains, to aid the Finns in the Continuation War. The decision caused a political "Midsummer Crisis" of 1941, about Sweden's neutrality. Note: Some countries may occasionally claim to be "neutral" but not comply with the internationally agreed upon definition of neutrality as listed above. Bound by Constitution of Austria and the 1955 Austrian State Treaty (demanded by Soviet Union at the end of the Second World War and guaranteed by the Soviet Union, the United States, Britain and France). The constitution prohibits military alliances and foreign military bases in Austria. An EU Member since 1995: military non-aligned, see points of debate § European Union. Neutral since its military was dissolved in 1949. Ratified by law in 2014. In August 2012, the Government of Ghana announced that due to the death of President John Atta Mills, the state implemented a closed-neutral policy. Is a member of the Non-Aligned Movement. Established a policy of neutrality during World War II, known as the Emergency in Ireland. Despite this policy, Ireland made concessions to the Allies by secretly sharing intelligence and weather reports as well as by repatriating downed RAF airmen. It was believed that Ireland would take the German side if Britain attempted to invade Ireland, but would take the British side if invaded by Germany. After the war, it was discovered that Germany had drawn up plans to invade Ireland in order to use the country for launching attacks into Britain, known as Operation Green. Conversely, had Ireland been invaded, the UK had drawn up secret plans to invade Ireland in collaboration with the Irish Government to push Germany back out, known as Plan W.
Ireland was invited to join NATO but did not wish to be in an alliance that included Britain. Attached the condition of Irish Unification to membership. Was clear that NATO would defend Ireland in the event of war, in part because Northern Ireland belonged to Britain. An EU Member since 1973: military non-aligned, see points of debate § European Union. Was granted a special acknowledgement in the Seville Declarations on the Treaty of Nice due to its views on the use of force in international politics. Neutral because the military was dissolved in 1868. Policy of neutrality since 1980, guaranteed in a treaty with Italy. An EU Member since 2004: military non-aligned, see points of debate § European Union. With the exception of its participation on the side of the Allies in World War II. Opened its borders in the 20th century to political refugees fleeing the military dictatorships of South America and Spain. Since 2000, Mexico ignored the neutrality policy under foreign secretaries Jorge G. Castañeda and Luis Ernesto Derbez. Whether historical neutrality is to be kept is now internally debated. The Mexican formulation of neutrality is known as Estrada doctrine. During World War I Mongolia was neutral, but became a belligerent country of World War II. In September 2015, Mongolian President Tsakhiagiin Elbegdorj in the 70th UN General Assembly speech suddenly announced that Mongolia will implement the "policy of permanent neutrality," and called on the international community to recognise Mongolian neutrality. Article 11 of the 1994 Constitution proclaims "permanent neutrality". The neutrality of the Panama Canal is enshrined by specific treaty. Is member of the Non-Aligned Movement. After the 1994 genocide, Rwanda announced permanent neutrality in 2009 after joining the Commonwealth of Nations. The National Assembly of Serbia declared armed neutrality in 2007. Serbia is the only state in the former Yugoslavia that is not seeking NATO membership. The key narrative that has been used to justify the policy is the trauma of NATO intervention in 1999 and the ensuing secession of Kosovo*, but also close relationship with the Russian Federation. Expelled from the Federation of Malaysia, gaining independence in 1965. A founding member of ASEAN alongside its south-east Asian neighbours. Has not been involved in any war since independence except had an incident in 1975 when a South Vietnamese pilot flew his family out of South Vietnam as war refugees in a stolen plane (C-130a owned by the Smithsonian Air & Space) from the Vietnam War as the North Vietnamese communists were taking over the South. First nation in the world to declare neutrality in 1814. Formally proclaimed by King Charles XIV John in 1834. Sweden has not been part of a war since 1814. This makes Sweden the nation which has had the longest period of peace. Has adapted policy to protect its interests. In Second World War it allowed German forces through its territory to assist the Finns when attacked by the Soviet Red Army, while also protecting refugees from the Nazis. *An EU Member since 1995: military non-aligned, see points of debate § European Union. Self-imposed, permanent, and armed, designed to ensure external security. The 1815 Congress of Vienna re-established Switzerland and its permanent neutrality was guaranteed by Britain, France, Prussia, Russia and others. Swiss neutrality was so rigorously defended that the country refused to even join the United Nations until 2002. Declared its complete neutrality and had it formally recognized by the United Nations in 1995. The Lateran Treaty signed in 1929 with Italy imposed that "The Pope was pledged to perpetual neutrality in international relations and to abstention from mediation in a controversy unless specifically requested by all parties" thus making Vatican City neutral since then. A NATO member since 2009. Neutral stance from Treaty of London (1839) until the Treaty of Versailles. Proclaimed neutrality in October 1936 and severed 1921 alliance with France. Neutrality abolished again after Second World War. A NATO member since 1949. Is a member of the European Union. In accordance with the Treaty of Punakha in 1910, Bhutan during World War II to deal with foreign relations powers to Britain, Bhutan became the de facto wartime neutral country. A European Union since 1973. Declared its neutrality 1938, but was thereafter forced to allow troops of the Soviet Union to enter in 1939 and was occupied by it 1940 in accordance with the Molotov–Ribbentrop Pact. A NATO and EU member since 2004. A NATO member since 1999. A European Union member since 2004. The International Agreement on the Neutrality of Laos was signed in Geneva on July 23, 1962, by 14 nations, including the five permanent members of the United Nations Security Council. However throughout the Laotian Civil War, Laos was fighting the PAVN and Pathet Lao with the help of the United States among other anti-communist countries. Laos's neutrality can therefore be described as a "false neutrality". Declared its neutrality 1939, but was thereafter forced to allow troops of the Soviet Union to enter in 1939 and was occupied by it 1940 in accordance with the Molotov–Ribbentrop Pact. Neutral stance since 1839, abolished through its constitution in 1948. Self-imposed neutrality between 1839 and 1940 on the European continent. While neutral throughout World War I and World War II, Spain did lean towards the Axis, as evidenced by the Blue Division. A NATO member since 1982. A NATO member since 1952. Pursuant to the non-interventionist policy set forth by George Washington, the U.S. declared its neutrality at the beginning of both world wars. *However, it declared war on Germany during World War I in 1917 following the series of German U-Boat attacks on American merchant ships supplying war material to the Allies in the Atlantic Ocean and declared war on Japan in World War II in 1941 following the Japanese surprise attack on Pearl Harbor, Honolulu, Hawaii. Ukraine's parliament voted to drop non-aligned status on December 23, 2014. In its Declaration of Sovereignty (1990), Ukraine declared it had the "intention of becoming a permanently neutral state that does not participate in military blocs and adheres to three nuclear free principles" (art. 9). Neutrality was then enshrined in the 1996 Ukrainian Constitution, based upon the Declaration of Independence of August 24, 1991, containing the basic principles of non-coalition and future neutrality. Such policy of state non-alignment was re-confirmed by law in 2010. Although founding member of the Little Entente committed to it until its dissolution in 1938, after much German pressure Yugoslavia was forced to declare its neutrality between the Axis and Western powers. Ever since the Stalin-Tito split in 1949, Tito Yugoslavia became a buffer zone between the Soviet bloc and the West. Insisting in its neutrality in the Cold War, Yugoslavia became a founder and a leading force of the Non-Alligned Movement. ^ "The Avalon Project - Laws of War : Rights and Duties of Neutral Powers and Persons in Case of War on Land (Hague V); October 18, 1907". avalon.law.yale.edu. ^ "The Avalon Project - Laws of War : Rights and Duties of Neutral Powers in Naval War (Hague XIII); October 18, 1907". avalon.law.yale.edu. ^ a b c d e f g h i j k "Neutral European countries". nato.gov.si. ^ Oppenheim, International Law: War and Neutrality, 1906, p. 325. ^ "Armed Neutrality". Dictionary.com. Retrieved 27 April 2014. ^ "Armed Neutrality Law & Legal Definition". USLegal. Retrieved 27 April 2014. ^ "Armed Neutrality". Oxford University Press. Retrieved 27 April 2014. ^ Bissell and Gasteyger, The Missing link: West European Neutrals and Regional Security, 1990, p. 117; Murdoch and Sandler, "Swedish Military Expenditures and Armed Neutrality," in The Economics of Defence Spending, 1990, p. 148-149. ^ "Switzerland - Knowledge Encyclopedia". Knowledge Encyclopedia. Retrieved 27 April 2014. ^ Chapin, Emerson. "Edwin Reischauer, Diplomat and Scholar, Dies at 79," New York Times. September 2, 1990. ^ See, generally, Scott, The Armed Neutralities of 1780 and 1800: A Collection of Official Documents Preceded by the Views of Representative Publicists, 1918; Karsh, Neutrality and Small States, 1988, p. 16-17; Jones, Crucible of Power: A History of American Foreign Relations to 1913, 2009, p. 15-17. ^ Vinarov, Mikhail. cards/the-first-league-of-armed-neutrality "The First League of Armed Neutrality" Check |url= value (help). CiteLighter. Retrieved 2016-04-21. ^ Kulsrud, Carl J. "Armed Neutrality to 1780". American Journal of International Law. ^ See, generally, Scott, The Armed Neutralities of 1780 and 1800: A Collection of Official Documents Preceded by the Views of Representative Publicists, 1918; Karsh, Neutrality and Small States, 1988, p. 17. ^ Bienstock, The Struggle for the Pacific, 2007, p. 150. ^ "Protecting neutrality in a militarised EU". ^ International peace-keeping operations. Federal Department of Foreign Affairs. Federal Administration admin.ch. Retrieved 22 December 2013. ^ "Finland should stay militarily non-aligned: prime minister". 4 December 2017 – via Reuters. ^ Affairs, Department of Foreign. "Neutrality - Department of Foreign Affairs and Trade". www.dfa.ie. ^ "Malta to 'wait and see' before deciding on PESCO defense pact, Muscat says". ^ a b c Marandici, Ion (2006). "Moldova's neutrality: what is at stake?". Lviv: IDIS-Viitorul and the Center for European Studies. Archived from the original (MS Word) on 2008-10-30. ^ "The WWII camp where Allies and Germans mixed". 28 June 2011 – via www.bbc.co.uk. ^ Chen, C. Peter. "Sweden in World War II". ^ Brinkley, Dougals; Rubel, David (2003). World War II: The Axis Assault, 1939-1940. USA: MacMillan. pp. 99–106. ^ "Costa Rica". World Desk Reference. Archived from the original on February 11, 2008. Retrieved 2008-02-27. ^ "Ghana's President John Atta Mills dies". BBC News. 24 July 2012. ^ Neutrality in the 21st century - Lessons for Serbia. ISAC Fond. 2013. ^ Burke, Dan. "Benevolent Neutrality". The War Room. Archived from the original on 20 June 2013. Retrieved 25 June 2013. ^ Joe McCabe (1944-06-03). "How Blacksod lighthouse changed the course of the Second World War". Independent.ie. Retrieved 2016-04-21. ^ "Background Note: Liechtenstein". United States Department of State. Retrieved 2008-02-27. ^ "Imagebroschuere_LP_e.indd" (PDF). Archived from the original (PDF) on 2013-05-16. Retrieved 2014-11-19. ^ Woodliffe, John (1992). The Peacetime Use of Foreign Military Installations Under Modern International Law. Dordrecht: Martinus Nijhoff. pp. 99–100. ISBN 0-7923-1879-X. Retrieved 2009-04-11. ^ La Jornada (27 April 2007). "Adiós a la neutralidad - La Jornada". Jornada.unam.mx. Retrieved 2013-09-19. ^ "Why Mongolia wants to "permanently neutral" can be authorized for an observation". Tencent News. 22 October 2015. ^ "Constitution of the Republic of Moldova" (PDF). Archived from the original (PDF) on 2009-03-05. Retrieved 2017-04-18. ^ "TREATY CONCERNING THE PERMANENT NEUTRALITY AND OPERATION OF THE PANAMA CANAL" (PDF). ^ "Rwanda becomes a member of the Commonwealth". BBC News. 29 November 2009. ^ Ejdus, Filip (2014). "Serbia's Military Neutrality: origins, effects and challenges" (PDF). Croatian International Relations Review: 43–69. doi:10.2478/cirr2014-0008. ^ Carroll, Rory (4 March 2002). "Switzerland decides to join UN". the Guardian. ^ "A/RES/50/80; U.N. General Assembly". Retrieved 29 December 2009. ^ "Ukraine votes to drop neutral status". 23 December 2014 – via www.bbc.com. ^ "Ukraine's Neutrality: A Myth or Reality?". Retrieved 8 September 2014. ^ "Ukraine Parliament Ok's neutrality bill". Kyiv Post. Kiev, Ukraine. AP. 4 June 2010. Oppenheim, Lassa. International Law: War and Neutrality. London: Longmans, Green, 1906. Scott, James Brown. The Armed Neutralities of 1780 and 1800: A Collection of Official Documents Preceded by the Views of Representative Publicists. New York: Oxford University Press, 1918. "Woodrow Wilson asks U.S. Congress for declaration of war". The History Channel website. 2014. Event occurs at 10:51. Retrieved April 28, 2014. .
Wikimedia Commons has media related to Neutrality. "Armed Neutralities". Americanforeignrelations.com. Retrieved 2016-04-21. "NationStates • View topic - The League of Armed Neutrality (FT alliance)". Forum.nationstates.net. Retrieved 2016-04-21. "The First League of Armed Neutrality". Citelighter.com. Retrieved 2016-04-21. "League of Armed Neutrality". Everything2.com. Retrieved 2016-04-21. "Armed Neutrality Law & Legal Definition". Definitions.uslegal.com. Retrieved 2016-04-21. "The Neutrality Act of 1937 . FDR . WGBH American Experience". PBS.org. Retrieved 2016-04-21. "Wilson's First Warning to the Germans - World War I Document Archive". Lib.byu.edu. Retrieved 2016-04-21.